What do you call that when your favorite blog doesn’t update for four months at a time? Annoying? No, that’s not it… Sad? Something like that. Anyway, we’re still here, we’re still loco. We’ve had a busy summer but still found time to can and freeze tomatoes, pears, apricots, peaches, sauerkraut, corn, jam, strawberries, nectarines, green beans and lots of meat. Mom made kimchi the other day. 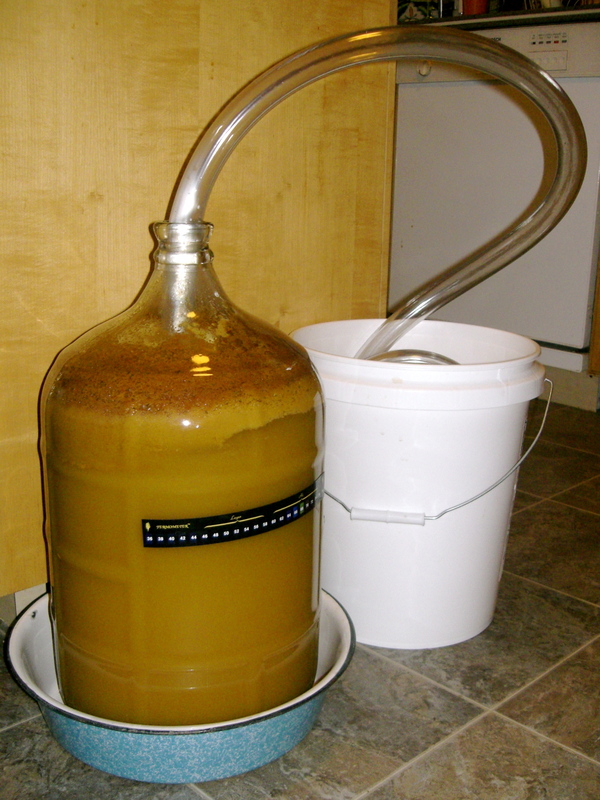 I made some blackberry honey lager this summer and hope to get around to making a batch of yarrow ale soon. Yarrow was a popular brewing ingredient in Europe before hops were popularized. The most productive members of the loco family this summer have probably been the chickens, who just peck things and lay eggs all day long, whilst being extremely loud and probably driving the entire neighborhood nuts the entire time. This inspired me to come up with what is probably one of the better ideas of my long and illustrious idea-thinking career — the “cluck collar.” This device would be very similar to a bark collar for dogs, only it would be very small so as to fit on a chicken’s spindly neck. If any of you know of a product developer looking for genius ideas that improve lives, let me know. Ok so today I’m sitting on my deck with my laptop, writing. I hear this super loud buzzing noise and look to my left to see a massive swarm of some type of insects. Ok, maybe they will just go away. 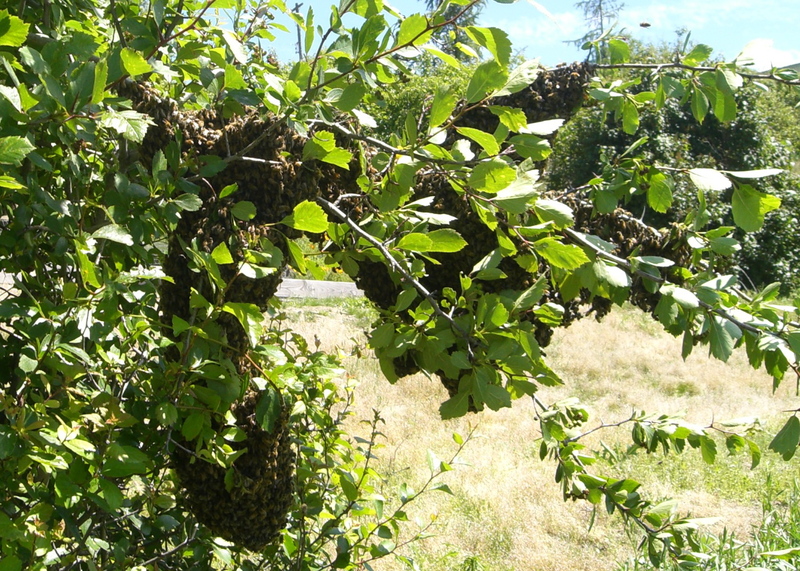 Pretty soon I notice they have moved to another part of the yard, near my beehives, and are are swarming around this little tree… so I get my dad and we take a closer look. They were honey bees! At first I was worried that they were MY bees and they had gotten too crowded and swarmed. So I put on my bee suit and went down to check things out. It turned out that all my bees were accounted for. (No I did not count each individual bee.) But I realized, hey, there’s a swarm of free bees in my yard. So dad put on a suit, we got a cardboard box and dad held up the box while I swept the swarm of bees into it. Then we took it down to an empty bee box and dumped ’em in. Voila! New beehive. If you or someone you know lost about 10,000 bees and you want them back, lemme know. Otherwise… finders keepers! Well, adoring fans, the loco year has come and gone! Our official stop date was May 21st – the same day that one Harold Camping predicted to be Judgement Day. Coincidence? We had quite a year. Thank you all for reading our little blog and letting us share with you. The number one question we have been getting lately is whether we are embarking on a second locavore year! Well, it was fun and interesting, challenging and confusing… yes, even frustrating at times. But we did what we set out to do; we tried it out and we learned what’s realistic for the long term and what’s not. Going forward, there are many things we will continue to do and some things that we just don’t want to do anymore! We’ll still get local meat and milk, grow a garden, can fruit and buy local products when we can. 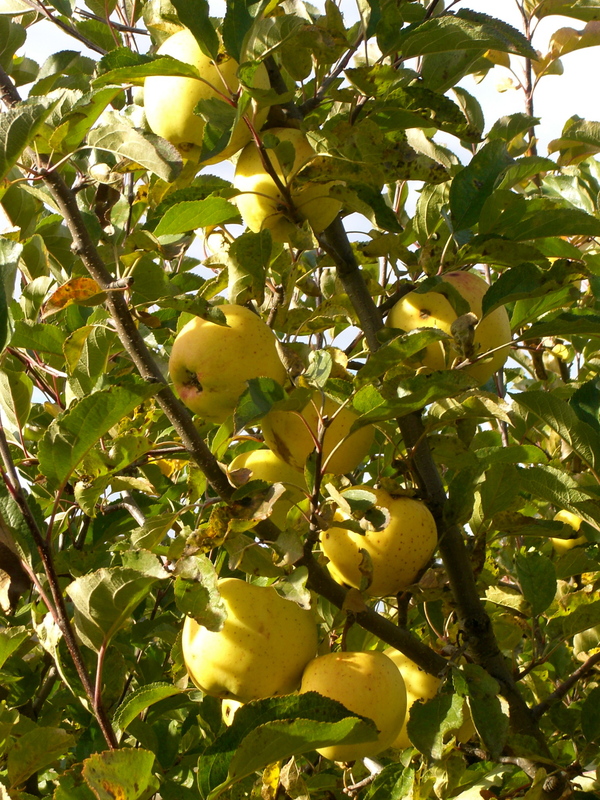 But we don’t want to spend another winter without fresh produce. I’ll still make cheese and Angela will still make yogurt… but no one wants to make bread. We will probably still do a lot of cooking with honey but I’m looking forward to using sugar for baking again. I personally am gearing up for a great summer homebrewing season and spent yesterday foraging in the neighbors’ yards for dandelions and whipping up a fresh batch of dandelion wine. Today I transferred it into the fermenting jugs but I had a little extra that wouldn’t fit, so I invented possibly the best cocktail known to man by tossing in some decidedly non-local rum, grand marnier and a squeeze of lemon. We ran out of some things this winter and spring- carrots, pears and apricots for example. 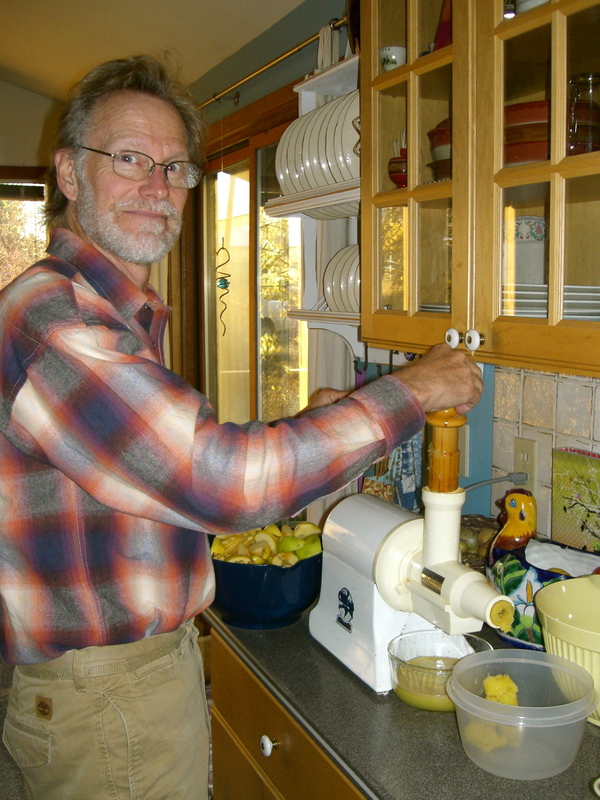 We still have garlic, frozen berries, a couple of jars of peaches, a little corn and a lot more stuff in small amounts. And some things we have so much of we’ll never get rid of it, like salmon, fava beans and tomato sauce. Ok, you’re probably wondering what we got at the grocery store on on our first non-local shopping trip. We bought butter, Sunchips, crackers, cookies, rolled oats and some hard lemonade! Dad got dates and corn chips. I picked out bananas, peanut butter, mayo, mustard, some decent sandwich bread, and cheese I didn’t have to make. Angela wanted rice milk and my mom bought a whole bunch of… vegetables!! The nicest thing about being done with locavoring is that when we don’t have time to make things from scratch we can just go to the store instead of going without it. It takes a lot of pressure off. Thanks again for sticking with our sporadic blogging. We may not be locavores anymore, but we’re still loco so keep checking back for our amazing tales of morel hunting, beekeeping, drinking and more. This is a really interesting and relevant article that discusses the new wave of young people finally entering the farming profession due to interest in sustainable, ethical food production. 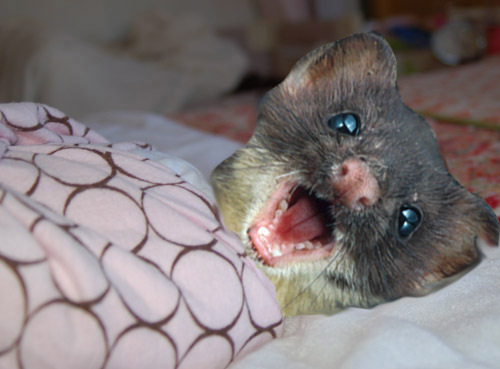 When weasels wake up on the wrong side of the bed... they're still cute. 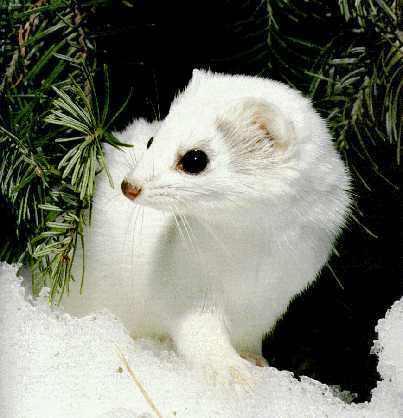 Solemn weasel portrait in snow. Fine, so Mom doesn’t want me starting a weasel farm. 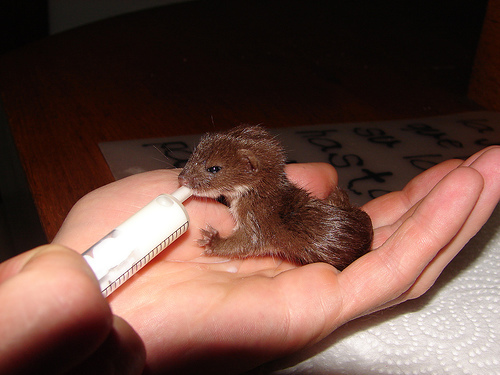 Or a weasel petting zoo. 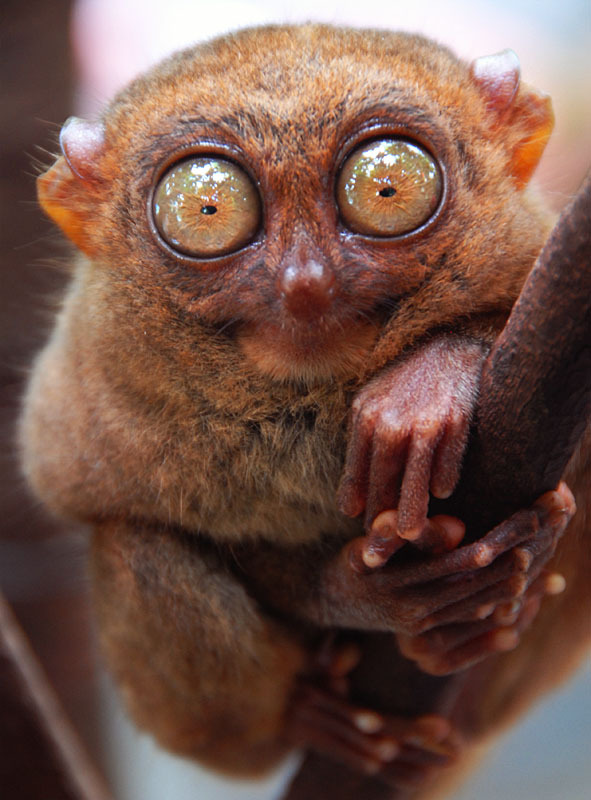 But I have a brand new idea for a brand new year… a tarsier farm. Snow is falling, Christmas is almost here, and the Locos are still eating! 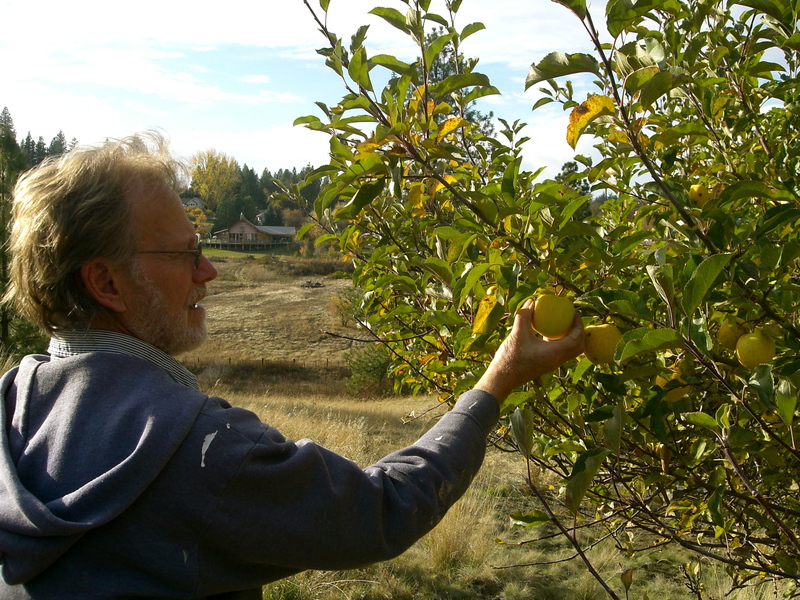 We are in good shape with lots of frozen and canned food and we are still making things with fresh apples (from Wilson Banner Ranch near Clarkston). We had to harvest all the carrots and parsnips still in the garden because the voles and deer were wreaking havoc out there. We’ve still got bunching onions growing and next year’s kale is up. The chickens are little egg-laying machines; we’re getting 6 to 12 eggs every day. 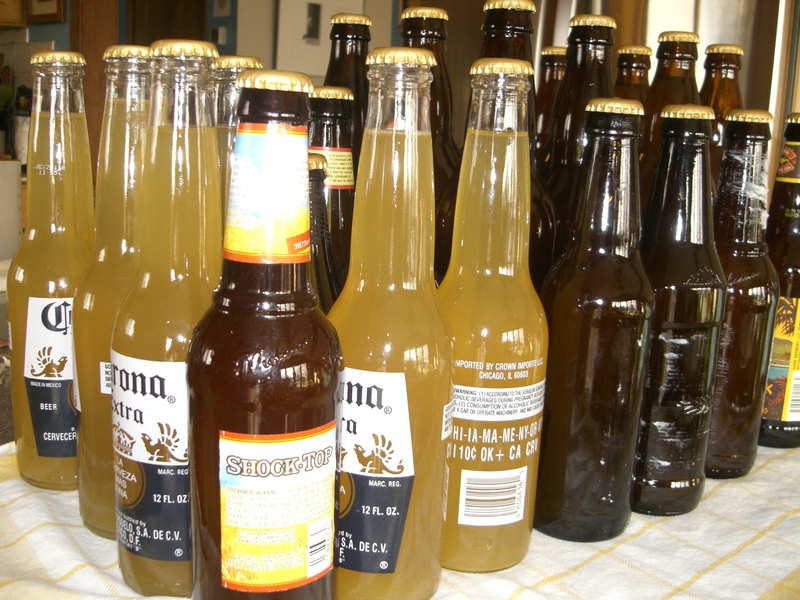 We got the hard apple cider bottled. It’s a lot different from last year’s batch but no one can decide which is better. It’s nice to be spending less time gardening, canning, freezing, dehydrating and doing yard work and more time on some other things, finally. Unfortunately for Mom, “other things” means being down with pneumonia for 7 weeks now. We all hope she gets better soon. Angela landed 3 part time jobs within a week so she’s busy on weekdays now, and I’ve been spending a lot of time working at my writing jobs. Dad’s band “The Senders” has been booked every weekend this month so I’ve been working on my amazing dance moves in my spare time. Happy holidays! It’s fall and you know what that means… no, not flu season. Hard apple cider! 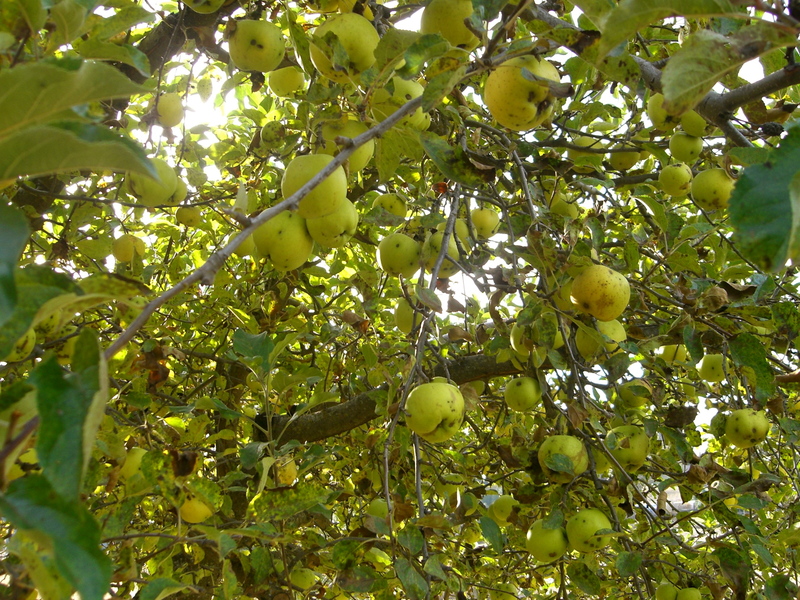 We got some pretty nice apples in our yard this year. You're doing a great job, Dad. Keep it up. I'm just going to snap a few more photos while you finish harvesting the rest of this tree. Can you go a little faster please Dad? We added a couple pounds of honey to 5 gallons of juice to increase the amount of fermentable sugar, which should result in a higher alcohol content in the final product. 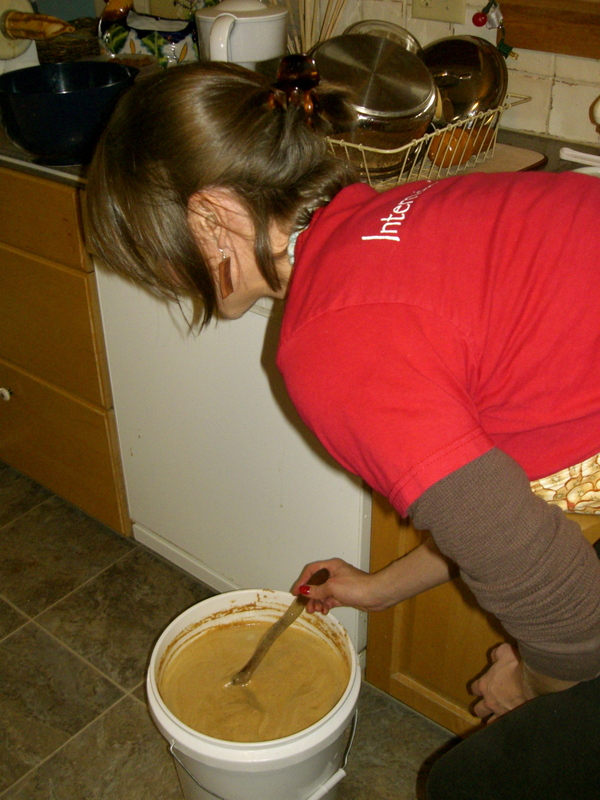 Then we put it in the carboy and pitched in the yeast. A lot of foam gets cast off during the first couple days of fermentation; my hope is that it will travel out my extremely high-tech apparatus (plastic hose stuffed in the top of the carboy), avoiding the volcanic spew of diarrhea-looking sludge that we had last year. It should be done in 3 or 4 weeks so if it sounds like something you might like, start sucking up to us now.